I am in a state of devouring any book with the word “France” in it … I’m counting down the days until I leave for France. It will be a super quick trip this time but enough to satisfy my obsession until we move there in December. I have just finished reading My Life in France by Julia Child and her nephew Alex Prud’homme. I had seen the movie Julie and Julia before but I watched it again whilst I was reading the book, and it almost sent me over the edge! If you don’t know what I’m all worked up about, it’s the true story of an American lady who moves to Paris after WWII because her husband is posted there for work. She goes from being a “loud, uncultured yank” to the english-speaking authority on French cooking after she learns to cook at the Cordon Bleu. The movie, released in 2009, follows Julie, a down-and-out writer in the present day who decides to reinvigorate her love of writing by committing to blog everyday about Julia’s mammoth cook book, Mastering the Art of French Cooking (first published in 1961). She cooks every one of her 524 recipes in 365 days. No easy feat if you know anything about this 2 volume encyclopedic-offering. 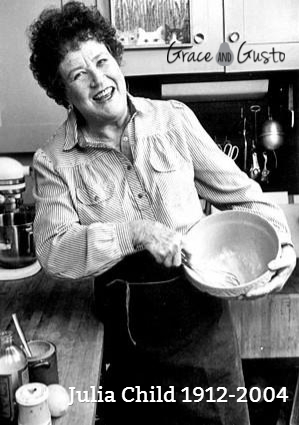 Reading about Julia Child’s arrival in Paris in 1946 had a profound effect on me. Her words literally brought Paris to life and I had a sense that despite reading about it nearly seventy years later, the city hasn’t changed much at all. I found myself reading about Julia’s first meal in France through tears! She ate at a restaurant called La Courronne (The Crown) in Rouen – this was the city I first visited at the age of 16 when I stayed with a family on school exchange. So I could vividly see the market square and Joan of Arc Memorial she was describing and in my 2012 edition of the Michelin Restaurant Guide, I even looked up the restaurant to find it still exists today! Imagine the state I’ll be in when I retrace her steps next year and eat at the same restaurant … I’ll have to order the Sole Meuniere (in Julia’s words “a morsel of perfection”) … more (happy) tears probably. After all this inspiration, I took myself off to the kitchen to create something Julia-ish. She loves her fish but I have a husband who is not a huge fan of white fish. So I chose monkfish – my mission was to convert him by serving up this very meaty, man-friendly fish. Monkfish itself is a fairly bland fish (it’s best asset in my opinion is its texture) so I whizzed up an olive tapenade and served it with lashings of creamy sweet potato mash … and I think I won him over. Tip: To avoid broiling the fish, salt it for an hour or so before you cook it to draw out its milky juices. Pat dry with kitchen towel before cooking. Lightly brush each fillet with melted butter or olive oil (or both! ), season with salt and pepper and sear each side in a hot pan for 30 sec – 1 min before roasting in a hot oven (220 degrees) for 6-8 mins depending on the thickness of your fillets. I used a Thermomix to create the tapenade but a good-quality food processor would do just as well. Pulverise on speed 5 for 3-5 seconds for a coarse consistency. Scrape down the sides and mince again for 3 seconds if you prefer a smoother tapenade. Taste – you may like to add a splash of balsamic vinegar to balance the flavours. Tapenade is fairly forgiving so play around with it to create your own flavour. Again, I used my Thermomix to create a really smooth consistency, but you can always use a good ol’ hand masher. Cook sweet potato in 900gms water at 100 degrees on speed 2 for 15mins. Check if soft through – you may need to cook for a few more minutes. Once cooked, drain and return potato to the TM bowl. Add butter, cream and salt and blend on speed 5 for 7 seconds. Scrape down the bowl and repeat until desired consistency is achieved. Leave in TM bowl to keep warm until you are ready to serve. In a large bowl, dress 100gms baby rocket with extra virgin olive oil and lemon juice, salt and pepper to taste. Divide rocket onto plates. Serve the monkfish on top of the rocket. 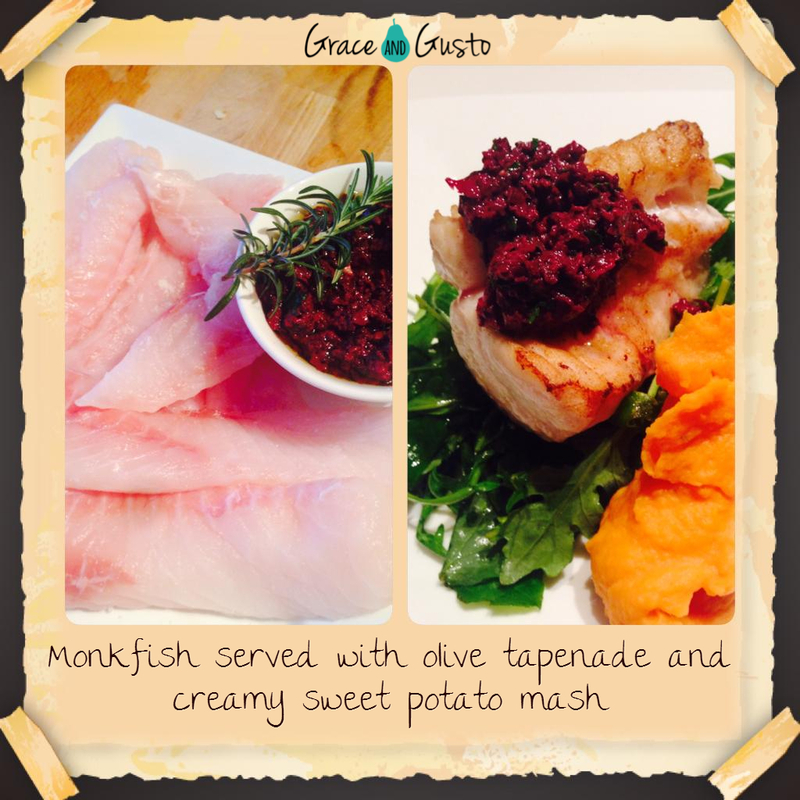 Dollop olive tapenade on top of fish and serve with a side of sweet potato mash … voila! Julia, your legacy lives on … what an inspiration. As she would say … Bon Appetit!! Categories: Family, Food, France | Tags: fish, France, graceandgusto, graceandgustofood, Julia Child | Permalink. It’s true I have been called “nuts” by a few … but that’s a story for another day! Instead, today I will share one of my signature recipes and one I love to serve up with drinks, or as a lavish garnish to a salad. These nuts make a beautiful gift too instead of fudge or other overly-sweet treats. I served these as “favours” at a baby shower I hosted recently. It’s nice to serve them on the day and then send them home with more to share with their families. These Sweet and Salty Nuts have even made an appearance on the Christmas Day table, and are perfect for entertaining because they can be made well in advance to save you time on the day. 1. Roast the nuts in a moderate (180 degrees) oven for 10mins or until fragrant. 2. Mix the sugar and spices together in a bowl. 3. Heat a large frypan to medium-high heat and pour in the roasted nuts. 4. Immediately add the sugar and spice mix and stir continuously for 10 mins or until the sugar has melted. The sugar and spices should stick to the nuts. 5. Remove from the heat to cool completely – store in an airtight container for up to a week. Categories: Food | Tags: Food, graceandgusto, graceandgustofood, nuts, Uncategorized | Permalink. I’m looking around me and the first thing I notice is that people are literally stopping to smell the flowers. They’re stopping to talk to friends, stopping to enjoy the music, the coffee, their kids, the fact that they have some time on their hands. Markets are truly a melting pot of cultures where we are offered such an extensive array of goods. From where I’m sitting I can see a local coffee roaster, a German smallgoods stall, a French baker, a Greek olive providore, a Maleny cheese maker, a Chinese fishmonger, and I’ve only just finished having an animated conversation with a Russian girl in the queue next to me about her year in Italy! Such a small world we live in. 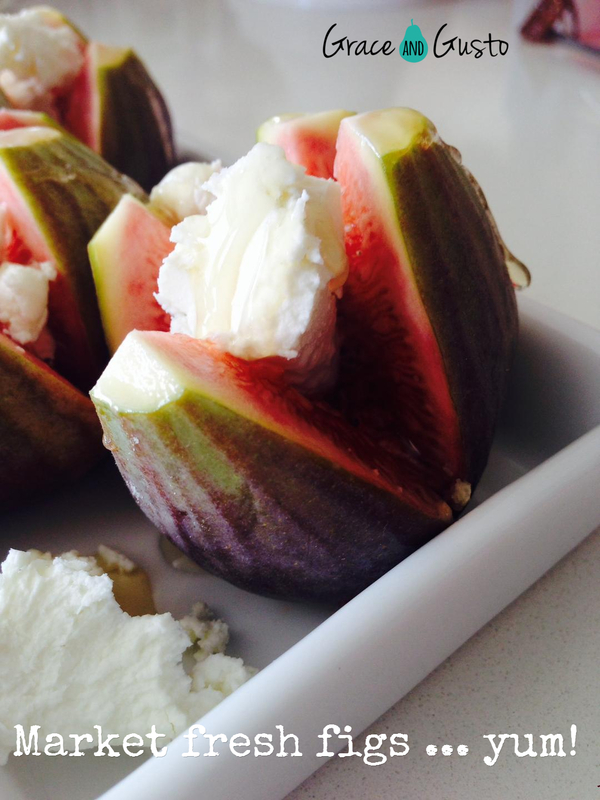 I’ve kept it simple today … I came home with these gorgeous late-season figs (best season in Australia is February-April). They are so divine on their own, that they need very little fussing over. My favourite way to serve these is with a soft goats cheese and a drizzle of honey. Perfect for brunches, lunch or dessert. So being here got me thinking … in a future post, I will run my own little experiment. Have you ever wondered if shopping at the markets is really cheaper? There’s no doubt the quality is better and produce is cheaper (I bought four figs for five dollars – you’d pay more like seven dollars retail), but can you avoid the supermarkets and still serve up creative meals on a budget? I will do the hard work for you. I’ll plan a menu for a week that includes 7 dinners, weekend lunches, kids school lunch boxes for during the week and I’ll compare the costs – markets vs supermarkets. I hope you’re as curious as I am! Categories: Food | Tags: brisbane, figs, Food, foodblog, foodie, graceandgusto, graceandgustofood, markets, smallworld, Uncategorized | Permalink. OK, for those of you with a sneaky sweet tooth like me, you’re going to fall in love with Nicole Joy‘s recipe book Eat Dessert for Breakfast. I have been madly cooking as much as I can from her book and I’ve had a tough time taste testing all her extraordinary and nourishing raw desserts (not!). She’s really hit a chord with me … I’m one of those people torn between my love affair with sweet food and my passion for serving sugar free food as often as possible. So her God-send cookbook showcases beautifully an array of tempting treats that are sugar free, dairy free and wheat free!! Yes it is possible! 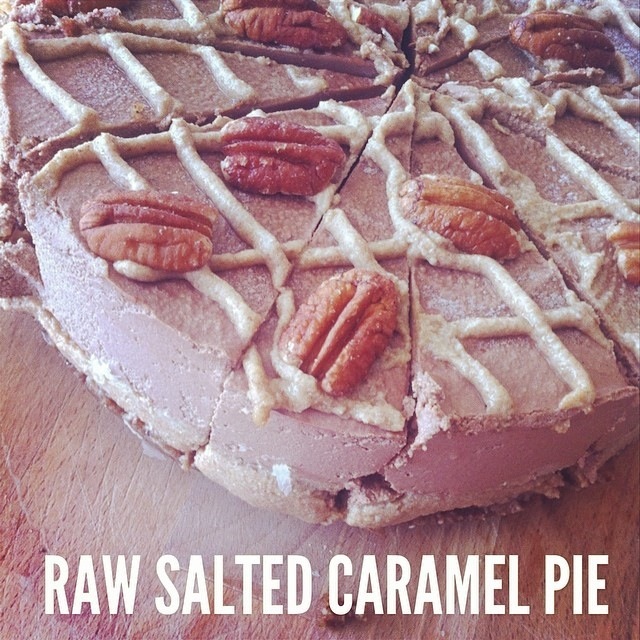 On Easter Day I served up a raw chocolate and salted-caramel pecan tart. I figured we all had easy access to plenty of sugar-laden Easter eggs and so I appreciated a dessert I could feel good about. The added bonus of her desserts is that they can be made days in advance and kept in the freezer. Perfect for busy mums and people who love to impress. I am also guilty of keeping a small stock of individually cut slices ready to defrost when the need for a little something post 8pm arises. Is that just me or can you relate?? Anyway, enjoy browsing her site and check her out on instagram and pinterest (nicolejoyinspire) … last night she posted a gorgeously (is that a word? it is now …) decadent Double Choc & Raspberry Swirl Tart – I think I’ll have to make that tonight. And what a bonus that we can call her our own … she hails from Queensland. Now, to get myself invited to her place for dinner … or just dessert!! Enjoy your day with grace or gusto … or both! Categories: Food | Tags: caramel, chocolate, dessert, guiltfree, nicolejoyinspire, raw food | Permalink. “We write to taste life twice … in the moment and in retrospect.” I really wish this was an original quote but alas, I must pay credence to Anais Nin. Of course, she is a French woman – a writer who was celebrated for her accounts of self-discovery that fortified women challenging gender roles in the 1960s and 70s. I believe it tastes sweeter when you relive an experience for the second time, and so I have decided to muster all my courage, cast away any doubts, and begin to share my love affair with food. As some of you know, I flirt outrageously with the notion that I have a little French blood in me. I don’t actually, despite my best efforts in researching the family tree. But I do really really love that country and I can’t put my finger on why exactly. Perhaps it’s their sophistication with food and their passion for fresh produce? Perhaps it’s their many country scenes and ancient cityscapes that capture my imagination. It must have something to do with the language I can use well enough to impress my Australian friends? I guess it’s the noxious combination of all these things and more that have me planning our “year to unplug”. Only a crazy dream like mine would cause someone to uproot their family entirely and move to the other side of the world for an unknown, exhilarating adventure! Stay tuned for more about this as we near closer to Christmas. Over the coming weeks, my hope is that somewhere out there, the words I put down here will connect with someone to the point that I can inspire them … to cook, to create, to do whatever it is that they love. I intend to share my learnings of home cooking – some posts will be family favourites, some will delve deeper into the origin or nutrition of certain produce and other posts will profile other companies, cooks, businesses, projects or products I have come across and am impressed by. 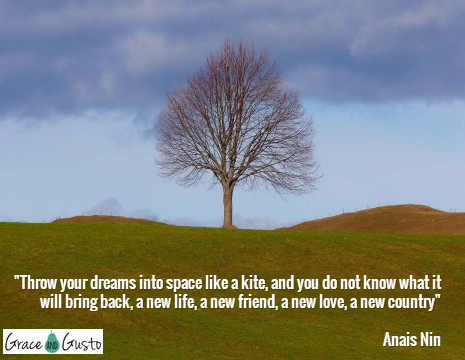 Categories: Family, Food, France, Grace, Gusto | Tags: Anais Nin, Family, Food, foodie, France, Grace, graceandgusto, graceandgustofood, Gusto, inspire, Uncategorized | Permalink.